On 31st Mar 2019 – divine music outpoured at Gangai Kondan Mandapam at Thiruvallikkeni. Music is heavenly when it is purely devotional – in our cult, it is Nama Sankeerthanam, more colloquially bhajans. Before Panchanga release function, was the soul-stirring performance of singing bhajans by ‘Bakthaswara Bhajan Mandali’ who with the guidance of Kanchi Sri Sankaracharya swami has been doing bhajans, nama sankeerthanam, annadhanam, education aid and more for the past 33 years. .. ..
Nama sankeerthanam ~ chanting the various names of God is very sacred. விஷ்ணுசித்தன் என்ற பெரியாழ்வார் - தமது பெரியாழ்வார் திருமொழியில் - கண்ணன் பிறந்தது முதல், தவழ்ந்தது, விளையாடியது, கண்ணனுக்கு அம்புலியைக்காட்டி சோறு ஊட்டியது, நீராடியது, சிறந்த நறுமண பூக்களை சூடிக்கொண்டது என ஒவ்வொரு பருவமாய் சீராட்டி படி வருகையில் - குழந்தைகளுக்கு, அழகான நமக்கு அருள் தரும் ஸ்ரீமன் நாராயணனின் பெயரை சூட்டி, அவர்களை பலவாறு கூப்பிட்டு மகிழ்தல் எவ்வளவு சிறப்பானது என விவரிக்கிறார். ஆழ்வார் அருள்வாக்கு : "கேசவன் பேரிட்டு நீங்கள் தேனித் திருமினோ" - செல்லக்குழந்தையை - செங்கணெடுமால் சிரீதரா, வானுடை மாதவா, குலமுடைக் கோவிந்தா கோவிந்தா என்றெல்லாம் செம்பெருந் தாமரைக் கண்ணன் பேரிட்டழைத்தக்கால் ~ அத்தகைய மகனை பெற்றோர் நரகம் புக மாட்டார்கள். 14th Apr 2019 would mark the starting of Tamil new year ‘ Vihari’ and naturally everyone is curious to know how the year would be ! Do you know …: “ Sarvathari, Virothi, Vikruthi, Kara, Nanthana, Vijaya, Jaya, Manmatha, Thurmukhi, He Vilambi .. .. (names of Tamil New year – 10 of them preceding Vihari) - …………. On Sunday, 31st Mar 2019, it was a grand gathering at Gangai Kondan Mandapam in Thiruvallikkeni…….. reason… ‘Panchangam release of ‘Brahmins Welfare Association’, Triplicane and Yours Truly was on stage compering. “In the ‘VaivasvathaManvantharam, after passage of 27 Maha Yugas ~ now in the 28th Mahayuga – after passage of 3 Yugas ~ in the Kali Yuga – after passage of 4 lakh 28 thousands of years – in the year 5119 Salivahana Saha 1940 – Vilambhi Varusha Panguni thiruvonam day (31.3.19) …… should go the lengthy introduction exactly describing the day on which the ‘Vihari’ Varusha Panchanga release function was held’. A panchāngam (பஞ்சாங்கம்) is not simply a Hindu calendar and almanac, but more important book that follows traditional units of Indian timekeeping, and presents important dates and their calculations in a tabulated form. Panchāngams are published in India by many learned authors, societies, academies, and universities. Different publications differ only minutely, at least for a casual or un-trained reader. They forecast celestial phenomena such as solar eclipses, forecast weather (rain, dryspells) as well as more mundane occurrences. The study of Panchāngams involves understanding Rasiphalan, the impact of the signs of the zodiac on the individual. Astrologers consult the Panchāngam to set auspicious dates for weddings and the like. ® Smt Suganthi Krishnamachari, author, translator, writer on varied subjects like – literature, music, heritage, history, visishtatvaidham ..
® Sri VB Mukundan (Kanchi Krishna), Secretary – BWA Triplicane. The programme started with ‘திருமங்கைமன்னன் - ஸ்ரீ பார்த்தசாரதிக்கு மங்களாசாசனம் செய்த விற்பெரு விழவும் பாசுரம்” by Sri S Sampathkumar. President KVR welcomed the audience. Yours Truly introduced the Guests and compered the event. After speeches by the Guests, Panchangam was released by Smt Suganthi Krishnamachari – received by the dignataries on the dias. It is not simply a religious book – the compiling of this requires lot of precision Maths. While it is Day : 24 hours : 60 Minutes : 60 seconds ….. the calculations are much more minutely accurate in Vedic and computation of Panchangam ~ it is 48 minutes = 1 muhurtham; 24 minutes = 1 nazhigai; 60 nazhigai = 1 day; 2 ½ nazhigai = 1 hour…….. 15 days is = 1 paksham; 2 months = 1 ruthu;….and minutely …. 1 Paramaanu = 0.0002 seconds … the book contains so much of useful information and should be treasured in every Brahmin house. Sri K Padmanabhan (Kovai Pathu) drama artist, who has been rendering great service for over 50 years, through Sri Guruvayurappan Seva Samithi was honoured on stage. Kanchi Krishna, Secretary was honoured on the dias for preparing this panchangam. TJ Ramani proposed vote of thanks. 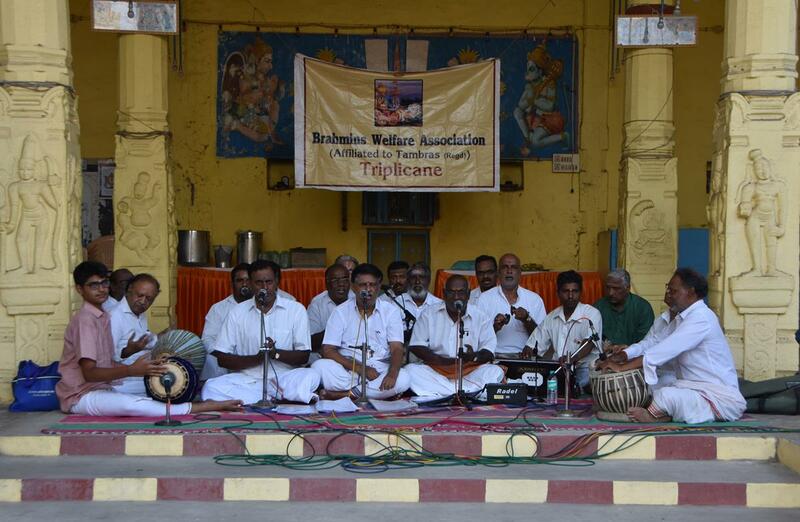 In all, it was a grand show organized by Brahmin Welfare Association of Triplicane. Copies of new panchangam were distributed to all those present at the mantap. Prasadam too was distributed. Here are some photos of the function.